2) ... G.D.H.G de Mevius is sometimes credited with one confirmed and seven unconfirmed victories (Franks, Norman - Guest, Russell * Alegi, Gregory: Above The War Fronts (A Complete Record of The British Two-Seater Bomber Pilot And Observer Aces, The British Two-Seater Fighter Observer Aces, And The Belgian, Italian, Austro-Hungarian And Russian Fighter Aces 1914-1918), Grub Street 1997). 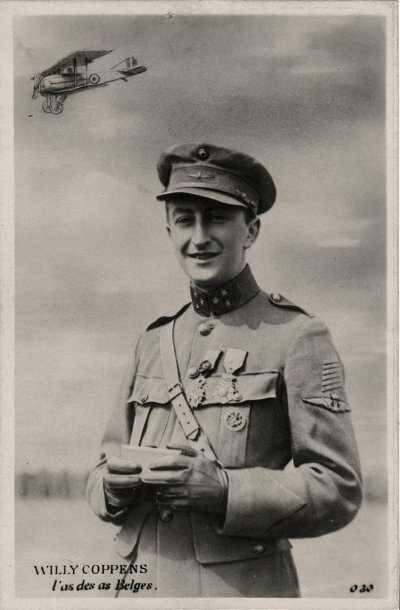 4) ... Jacques Goethals is sometimes credited with two confirmed and four unconfirmed victories (Pieters, Walter M.: Above Flanders' Fields: A Complete Record of the Belgian Fighter Pilots and Their Units During the Great War 1914-1918, Grub Street, London, 1998). 5) ... Jan Olieslagers is sometimes credited with six confirmed and sixteen unconfirmed victories (Pieters, Walter M.: c.d.). 6) ... 4 confirmed and 7 unconfirmed as observer. 7) ... R.G.F. Rondeau is sometimes credited with two confirmed and two unconfirmed victories (Pieters, Walter M.: c.d.). 8) ... Andre Emile Alfons de Meulemeester is sometimes credited with 11 confirmed and 17 unconfirmed victories (Cony, Christophe: L'Aigle des Flanders (André de Meulemeester), in Avions, No. 74, 1999). Willy Omer François Jean baron Coppens de Houthulst. Hanriot HD 1 No 23 of Sous-Lt Willy Coppens, 9ème Escadrille Belge, Les Moëres, September 1918. Cony, Christophe: L'Aigle des Flanders (André de Meulemeester), in Avions, No. 74, 1999. Cony, Christophe: Fernand Jacquet, L'as aux Lunettes, in Avions, No. 83, Fevrier 2000. Cony, Christophe - Duwels, Yves: Les as Belges de 14/18 (IV): Jan Olieslagers, le démon anversois, in Avions, No. 92, Novembre 2000. Cony, Christophe - Duwels, Yves: Les as Belges de 14/18 (IV): Jan Olieslagers, le démon anversois, in Avions, No. 93, Décembre 2000. Franks, Norman - Guest, Russell - Alegi, Gregory: Above The War Fronts (A Complete Record of The British Two-Seater Bomber Pilot And Observer Aces, The British Two-Seater Fighter Observer Aces, And The Belgian, Italian, Austro-Hungarian And Russian Fighter Aces 1914-1918), Grub Street, London 1997. Guttman, Jon: Balloon-Busting Aces of World War 1, Aircraft of the Aces 66, Osprey Publishing, July 10 2005. Jablonski, Edward: The Knighted Skies - A Pictorial History of World War 1 in the Air, Thomas Nelson & Sons Limited, London 1964. Pieters, Walter M.: Above Flanders' Fields: A Complete Record of the Belgian Fighter Pilots and Their Units During the Great War 1914-1918, Grub Street, London, 1998. Shores, Christopher: Air Aces, Presidio Press, Novato, CA, 1983. Skulski, Przemyslaw - Sankowski, W.: Asy Wojny 1914-1918, Ace Publication, 1994. Toliver, Raymond F. - Constable, Trevor J.: Fighter Aces of the U.S.A., Schiffer Military History, 1997. Ciel De Gloire - Histoire des As de L Aviation de 1914 a nos jours, http://www.cieldegloire.com/.